I’ve waited to write this post since I was 19 years old. I’m coming to you, my readers—many of whom I’ve known since I started on this journey—to officially announce my book, The Obstacle Is The Way, and offer these amazing bonuses as a thank you for your support. It started with a decision to really get into reading, which brought me to an old book (Marcus Aurelius’ Meditations). That amazing book guided me to many other books (many we’ve read together) and eventually led to the creation of this book (which I am as proud of as I have been of anything I’ve ever done). I can’t tell you how grateful I am for all the connections I’ve made over the years with you. So let’s get to it. From this maxim I’ve created a manual for overcoming obstacles and turning them into opportunities—illustrated with dozens of stories (many of which we read here first) from John D. Rockefeller to Amelia Earhart to Ulysses S. Grant to Steve Jobs to George Clooney to Barack Obama to Laura Ingalls Wilder to Arthur Ashe to Demosthenes to Abraham Lincoln to Thomas Edison. It is a book that will become more valuable to you as you revisit it, using it when faced with the challenges we all face in life. *1 supplementary PDF, “How I Wrote The Obstacle Is The Way”, which details the process that allowed me to write the book in three months, and how a chance encounter with Tim Ferriss and a trip to Rome helped me finish the manuscript. *1 exclusive copy of “The Obstacle Is The Way Reading List”, which details all the books that led to me writing The Obstacle Is The Way. *1 exclusive copy of my entire archive of Reading Recommendations, which includes every book I’ve recommended over the past four years. I’ve never compiled a full list of everything that’s ever been in the list before—it will be hundreds of handpicked books not available anywhere else. Click here to pre-order 1 copy, then email your receipt to [email protected] with “Preorder #1” in the subject. *1 private/confidential copy of my Mastery of Marketing Reading List (required books and articles) that I used to train myself and now each of my new employees. *1 one-of-a-kind, original signed 4×6 notecard that I actually used while researching and writing this book. I’ll pick one at random, sign it, and mail it to you. You can use it as a bookmark, paste it inside your copy of the book, or put it on your wall. *3 personalized book recommendations that I’ll select just for you. You tell me a little about what you like to read and I’ll personally pick out three of my favorite books that I think you should read and will love. *1 invitation to a one hour private group Q&A webinar where I’ll answer questions live about The Obstacle Is The Way, my previous books, and anything else anyone asks. Click here to pre-order 5 copies, then email your receipt, mailing address, and your reading interests to [email protected] with “Preorder #2” in the subject. On top of all of the above, you will get a private 30 minute Get Unstuck one-on-one call with me. In this call, we can talk about whatever you’d like, whether its strategy, books, or obstacles. It will be your open forum. As you can see, I usually charge $1500 for an hour call like this—even more when I talk to companies and public figures. Because you guys have supported me and have been along for the ride over the years in the creation of this book, I wanted to give you a ton value for this release. Click here to pre-order 15 copies, then email your receipt, mailing address, and your reading interests to [email protected] with “Preorder #3” in the subject. My assistant will email you to schedule our call together. Maybe you have a better idea for a bonus? Well, make me an offer of how many books you’d preorder for it (Hint: Start with more than 15). I’ve worked with billionaires, politicians, actors, artists, and musicians. I’ve written book proposals, created bestselling books, spoken at conferences all over the world, and lectured at world-renowned universities. All of that is on the table. Want to work together? Want me to do a keynote for your company or conference? Advise your startup? Have a daylong personal consult? Let me know what you have in mind, I’d love to make something big happen. Put “Choose Your Own preorder” in the subject line and email [email protected] and I’d love to talk. Pre-order 5 copies, Get 3 PDFs, plus a private/confidential copy of my Mastery of Marketing Reading List, a signed Commonplace Book notecard, 3 personalized reading recommendations, and a private invitation to an hour long webinar with me. To get these bonuses, all you have to do is email [email protected] with the subject line preorder #1, #2, or #3 (depending on which one you choose), and a screenshot of your Amazon or B&N or other receipt. The PDFs and reading lists will all be sent in mid-April, possibly earlier if I decide not to batch them. My assistant will email you to schedule our call together. This book will be a success. Thanks Ryan for your blog and your thoughts. Ryan, what about if I live in the UK? It has a UK publisher as well and should be on Amazon there. Same stuff applies. I was about to ask this, too! Congrats with the new book Ryan. Looks like a great book, put it on my Amazon Wishlist – can’t wait! Do kindle orders count for the Best Seller List? Does the deal still apply for this provider? Sorry to add two comments, but I noticed that on Book Depository there are two versions (both hardbacks) of the book. One has a blue cover (http://www.bookdepository.com/Obstacle-is-Way-Ryan-Holiday/9781781251485?b=-3&t=-21#Reviews-21) and they have different sub-titles. Is there any difference in content between the two? What is the difference? I am about to buy one of them. One is published by a publisher in the Uk and has a different cover. Congratulations on your new book. 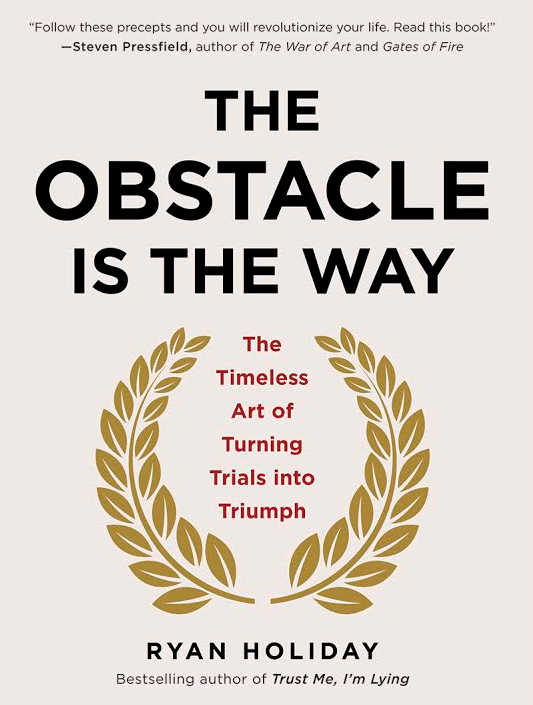 I would like to know if there is any problem pre-ordering 1 copy of ‘The Obstacle is The Way’ on amazon.com from Spain. Would I still be able to opt to the bonuses? Would you count the ebook version as part of the pre-orders? is the “Preorder #3” still open? Yes, there are a couple spots left. Now that May 1st is past, is there any way to get ahold of “The Obstacle Is The Way Reading List”? Hi Ryan heard you highly rec’d on Ian Guider book Buzz Newstalk radio,Ireland, dying to read all about the Obstacles getting over,under, around and through. Come on bookdepository.co.uk get cracking. What happened to the Kindle edition? Google indicates it was on sale for a while but now only hardcover and audio book editions seem to be available by Amazon. How do I buy an electronic version now? nice to read this website, and I used to pay a visit this weblog every day. Are you sharing the PDF copy of the entire archive of Reading Recommendations with those that didn’t discover you and your work till 2015? It would be great if you can.